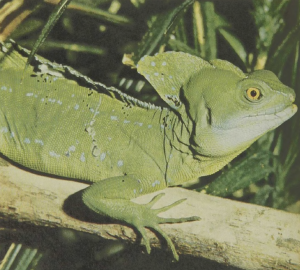 The basilisk was a mythical crowned animal, and these small lizards inherited the name because of their casque-like heads. They are medium-sized — up to 30-inch-long — iguanas of the river rain forests of central and northern South America, and naturalists’ interest rests on more than mythology. Their main specialization derives from running across the surface of the water without sinking. The Basilisk’s toes are long and each is provided with a flap along the outside; the flap opens when the foot hits the water. While this imposes a certain resistance during the down- stroke, the flap immediately closes when the foot reverses so that the toe can be withdrawn with little resistance. Small animals have been observed to run for hundreds of feet across the water surfaces; larger lizards run for shorter distances, obviously with more effort. Basilisks can also swim and do so with facility. The water walking allows them a rapid escape from enemies on land without the risk of being eaten by fishes or caimans that might lurk in the waters.